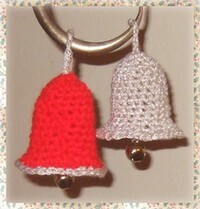 Get set to make some jingle bell ornaments with this free crochet pattern for Christmas bells. 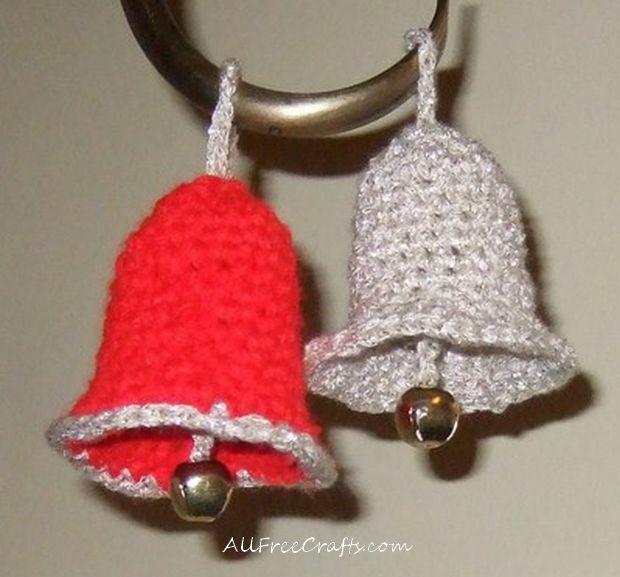 You can use any worsted weight yarn scraps for these Christmas bells, but sparkle yarns or metallic yarns have that extra bit of shine to catch the fairy lights. We now also have instructions to make Knitted Christmas Bells with a self-rolling brim, or Crocheted Christmas Wreath Ornaments. 1. Ch. 4, join with slip stitch. 3. Ch. 1, 1 sc in first stitch, 2 sc in next stitch, (sc 1, sc 2 in 1) around, sl st to close round (12 stitches). 4. Repeat Round 3 once (18 stitches). Rounds 5 – 11. Ch. 1, sc in each stitch, sl to close round (18 stitches). 12. ( Ch. 1, sc in next 2 stitches, 2 sc in next st., (1 sc in next 3, 2 sc in next stitch) around, sl to close round. Attach yarn to top center of bell and make a chain long enough to form a hanger. Fold the chain over to make a loop and slip stitch to the top of the bell. Pull yarn through to wrong side, and form a chain long enough suspend the brass bell just below the bottom of the bell. Tie bell to the chain. Fasten off. If you want to trim the bottom of the bell in a different color, change yarn on row 12, or just for the final row. What is the best way to stiffen the bells? Hi, Sheryn, I’ve never needed to do this, as they seem to have enough body to hold their shape. If I were to try, however, I’d use a diluted half-and-half mix of white glue and water, or commercial fabric stiffener. Soak the bell in the solution, then drape it over an egg cup or small glass to hold the shape while the bell dries. If you try it, will you let me know how well this works please?